February | 2013 | Thy Glory O' Nigeria..! Nigeria, especially the sharia states in northern Nigeria, is quite unsafe. There are many unsafe places in the world, like USA and South Africa as common examples. However the reaction of government and authorities to insecurity is very important. In one of the several murders committed in Northern Nigeria and other places under the disguise of religious riots or religious intolerance, Victor’s parents were murdered. The story has circulated on the internet and many Nigerians have posted it on their facebook pages. The useless Nigerian government has not thought that it should apologize to Moses. The young man was very influential in the recent victory of Nigeria in South Africa. The government does not feel sorry at all for all its failings since 1960. Instead the government is looking forward to more failures and disasters. The insecurity around the country is still on the rise and it appears that Northern Nigeria is under the control of extremists and terrorists of Nigeria, Sudan and Mali. Victor Moses’ sense of nationalism is exemplary. He appears to be the most patriotic Nigeria ever. Many people will disown Nigeria even under less severe circumstances. His parents were murdered when he was a teenager and after living in England following the disaster he abandoned England and represented Nigeria. destroyed Nigeria and contributed directly and indirectly to the death of his parents. Moses Victor, may you live long..! Patience and Goodluck Jonathan, Stop Telling Lies..! A few weeks ago, that should be in January 2013 Nigeria’s ruler Mr. Goodluck Jonathan went on air on CNN to tell the world that electricity has improved in Nigeria. Specifically he mentioned Lagos and Abuja as places were things have gone better. In a follow up report Amanpour was able to prove that Goodluck Jonathan lied. Lagosians were interviewed and they completely denied the report that power supply has improved in Lagos. I’d been listening more to Nigerian Radio in recent weeks and one of the daily programs on many radio stations is that callers are allowed to report traffic and power supply in their area. Usually you hear very tragic reports about the poor traffic and almost complete absence of electricity. Nigerians are living in almost complete darkness. It is possible that Nigerians have the worst power supply system in the world. Syria is at war and probably approaching similar situation in some areas of the country. I wrote a blog sometimes ago describing NEPA as the worst government institution in Africa. I stand by that report. What is more damaging in this situation is that Nigeria’s ruler has become a very serious liar. In a country where there is no shame that is not unexpected. With all the lies and looting that Goodluck Jonathan has perpetrated, you will be amazed what kind of country Nigeria is. You will be more shocked how Nigerians think really! In a slightly normal society, even if all of Jonathan’s previous atrocities are covered, the ones that he has openly committed in recent times are enough to chase him out of power by force or by constitutional means. But Nigeria is a very abnormal country where evil reigns and stupidity rules. You’ll hardly find a thing that is normal about the government-its formation and operations. I remembered when he was on his campaign trail and saying times without number that Nigerians should give him only one term and he would change things around for them. Under Jonathan, corruption got a new high. He gave power and position to the people from his region and they continue the usual process of milking Nigeria, the same atrocities that have crippled a potentially great nation. It is difficult to comprehend the madness of Nigerian political class. It is even more unbelievable the disconnection that the people are sufferng from, thereby making the country a complicated rat race. Nigerians don’t care about the government and consequently Nigeria was rated as one of the worse places to live in the world. Because of the disconnection mentioned above, the political class and the wealthy see something different from the over 100 million people living in absolute poverty. Jonathan and his spokespersons can deny anything and everything that Jonathan said on his campaign trails. It will be abnormal if Okupe and Abati do not tell lies. Nigerians may die of shock if the politicians and their handlers become truthful. Around August 2012 when Patience Jonathan was terrible sick and had to be flown out of the country, the useless Nigerian presidency as usual lied and said that Mrs. Jonathan was on holiday, resting. But in February 2013, she reportedly wasted N500 million of tax-payers money during a thanksgiving ceremony where she said that she was “dead” for 7 days and that she did 9 surgeries to correct her “unknown ilment”. She did not say exactly what happened to her but she was under the knife 9 times. At the same time, Joanthan, Abati and Mrs. Jonathan’s spokesman (whatever his useless name is) all came out and said that Mrs. Jonathan was resting because she has been tired from her activities. Who send her message? Anyway, like I mentioned earlier all of these lies and atrocities are enough to pursue Mr. Jonathan out of Aso Rock. But he is there, he reigns over the Kingdom of lies. And some Nigerian think Amanpour went too far? Really? Ask yourself, “how am I thinking”? It’s not that CNN is a saintly organisation but did Jonathan speak the truth? Nigeria is a fraud manufactured by the British 100 years ago. This country will not make it as a unit. The unitary form of government is a disaster. The overall intelligence of the people called Nigerians is at test. It has always been at test. How can they allow a system that doesn’t work? Nigerians pretend that they love one another whereas the real purpose of their political agenda is self-enrichment. Nigerians should stop, think and look for the truth. The truth is that the different tribes don’t like one another. Jonathan will continue to lie until his time and days are over. The persons who came before him lied and the ones that are coming after Jonathan will also lie and vanish. The system does not work and will remain rotten. The people will live hopelessly, believing lies. Under a regional system of government a man like Obasanjo quite evidently would never have emerged from western Nigeria. He has never won elections in his constituency and the surroundings. But he was Nigeria’s ruler (thrice!) because of the rotten political and military system. Unitary system has ensured that fools, thugs, idiots, robbers, nonentities and pretenders rule in Nigeria under military and pseudo-democratic dispensations. The time is now to stop this political nonsense, lies and hypocrisies. The greatest challenge is how to sensitize Nigerians and get them connected to the system. For as long as they remain disconnected as they are now, the lies will continue, the corruption rate will rise, the poverty and absolute failure of the system will become more visible. Nigeria will continue to benefit only the few-the rich and the connected. With Somalis returning home from around the world, if something drastic is not done, Nigeria will go from one of the worst places to be born on earth to actually becoming the worst place to be born and live. I can make a very strong insinuation that Goodluck Jonathan gave his brother in place of his wife who celebrated her return from hospital with an alleged sum of N500 million. Nigerian rulers are insane. When Jonathan’s brother died, Mrs. Jonathan was wearing gold. Now they have spent over N500m after this burial, they called it their own thanksgiving. On the Nigerian fronts, it took a long time before Goodluck Jonathan saw anything wrong with the Boko Haram killings. For him, that is the blood needed to run the wheel of corruption and keep the impunity in his government intact. 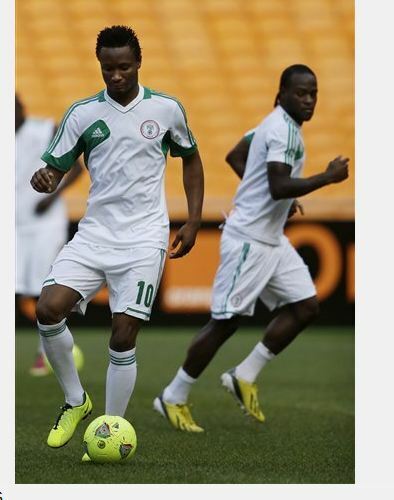 Nigeria defeated Burkina Faso by a lone goal scored in the 40th minute of the match played on the 10th of February. Sunday Mba scored on sunday to write his name in the history book. Nigeria won the tournament before in 1980 and 1994. Stephen Okechukwu Keshi becomes the second man ever to win the trophy as a player and a coach.